Motorola isn't exactly known for it's aesthetically pleasing phones, so we'll be pleasantly surprised if these new photos turn out to show the true design of the upcoming X Phone. , to be exact. Does that make them more or less likely to be for real? We're inclined to say less so up that salt intake, phone fans. Amazingly, the handset doesn't look like it fell out of the ugly tree and hit every branch on the way down. 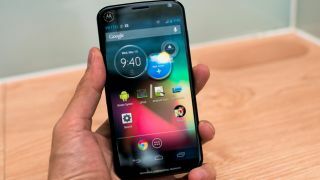 The photos show a handset on which Moto has finally eschewed the boxy-squared-off corners of yore and gone with a more rounded design. The back, which seems to be in a matt finish, looks lovely too - perhaps a little rounded which we bet would feel very pleasant in the hand. We're not sold on the images though, which are the first we've seen of a possible X Phone without a big ugly case messing the place up. The screen looks a bit suspect to us - it seems to have been deliberately blurred in the bottom right hand corner - and both images have an air of the render about them. We really hope the X Phone doesn't come with a giant Motorola logo in the top right hand corner as well as on the back, but this was present in the previous cased-up leak so we could be out of luck. The new images come from Vietnamese site Tinthe, which has been on the money with leaks before so who knows. Maybe they're legit. We won't know for sure until Motorola and Google pipe up - Google IO release, anyone?